The J. Paul Getty Museum's collection is divided between the Getty Villa, in the Museum's original location in Pacific Palisades above Malibu, and the newer Getty Center on a hilltop in Brentwood just off the 405 freeway. While Greek and Roman antiquities are the focus of the collection at the Getty Villa, the Getty Center houses the Getty's collection of Western art from the Middle Ages to the present. The Getty Center is not just one of the Top Art Museums in LA, but tops the list of the Top 10 Museums in Los Angeles overall. Although the immense collection of art that rotates through the Getty Center is impressive in itself, when you combine it with Richard Meier's architecture and Robert Irwin's gardens, it's an unbeatable combination. It can also be a little overwhelming if you try to see everything all in one visit. Even if you're not a museum person, strolling the grounds or enjoying a picnic in the gardens is a lovely way to spend an afternoon in Los Angeles. Don't forget your camera! From this hilltop fortress you'll get some of the best views in LA. Hours: Tues-Fri 10 am - 5:30 pm, Sat 10 am - 9 pm, Sun 10 am - 5:30 pm; Closed Mondays, January 1, July 4, Thanksgiving, and December 25. Cost: Admission is FREE, but there is a fee for parking. Parking: $15, $10 after 5 pm for evening programs and late open hours. Public Transportation: By Bus: Metro Bus 761 stops at the main gate on Sepulveda. Accessibility: All parts of the Getty Center are handicapped accessible via ramps, elevators and the tram from the parking structure. Standard wheelchairs and strollers are available without charge at the Lower Tram Station and at the coat check desk in the Museum Entrance Hall on a first come basis. Select materials are available in Large Print or Braille. Sign Language Interpretation is available by advance request at public events. Assisted Listening Devices are available for all public gallery and architecture tours and public events. Click through the slides to read more about the art, architecture, programs and amenities at the Getty Center and check out some more photos. You can walk around and explore the architecture of the Getty Museum's Getty Center on your own, but it's worth taking an architecture tour to really appreciate the whys as much as the whats in Richard Meier's design. The complex was built along three ridge lines at the edge of the Santa Monica Mountains above the 405 freeway and is as close as LA gets to a hilltop fortress. Multiple structures reach out along the north-south running ridges with the gardens separating the museum buildings from the circular research library and the café and restaurant building at the crux of the 2 ridges. The façade is a contrast in rough-cut Italian travertine and off-white enamel-clad aluminum panels, juxtaposing the prehistoric revealed fossils in the travertine with the smooth, modern, almost industrial feel of the enameled squares. The lines, angles and curves of the buildings are a joy to photograph. Strategically placed free-standing square-cut archways frame spectacular views across the LA basin. Artist Robert Irwin designed the 134,000 square feet of the Getty Center Central Garden, which spreads across the ravine between the museum buildings on one ridge and the research center and restaurant on the opposite ridge. There are over 500 plant varieties incorporated in the Central Garden, but the display is not static. Seasonal changes and the constant addition of new plants make for an ever-evolving landscape. A walkway crisscrosses an artificial stream that winds from the upper grounds down the ravine where it flows over a wall into the circular Azalea Pool. The azaleas in the pool are laid out in three intertwined circular mazes, with the maze theme continued in the paths of the surrounding Pond Garden. A Cactus Garden juts out onto the southern promontory. 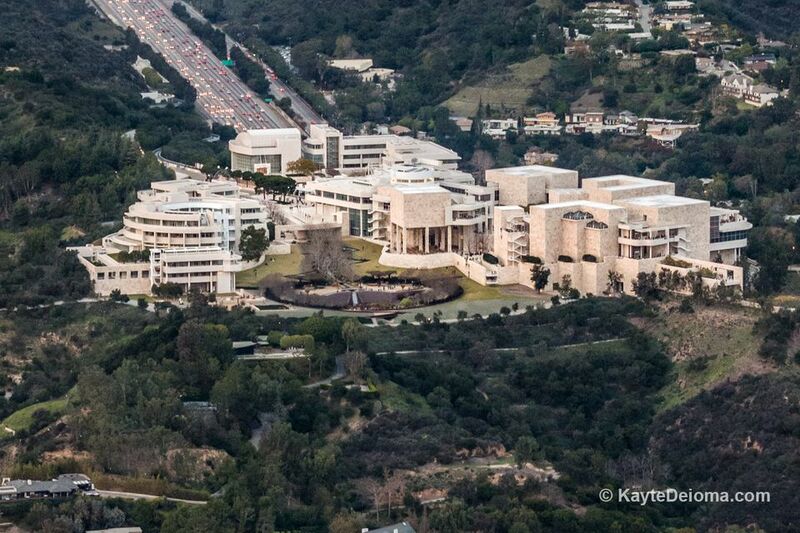 The Getty Center houses the J. Paul Getty's Museum's collection of western art from the Middle Ages to the present. There are a couple of permanent/semi-permanent exhibits with additional temporary exhibits from the collection. Ongoing exhibits include Neoclassical, Romantic, and Symbolist Sculpture and Decorative Arts and Medieval and Renaissance Sculpture and Decorative Arts. Other temporary exhibits are drawn from the extensive photo collection from the beginning of photography through present day, drawings from the middle ages through mid 1800s and the painting collection from 1295-1895. A self-guided Audio Tour is available if you want to explore on your own. Touch screen stations and video panels provide complementary material and documentation. Museum Highlight Tours are a great way to get a taste of the museum's most famous pieces. Exhibition Tours are one-hour docent-led tours focusing on specific temporary exhibits. Themed Tours rotate throughout the week covering different artistic periods. Gallery Talks range from 15 minute presentations on a single work of art to 1 hour presentations with a local artist, curator or other expert. Architecture Tours of the Getty's Center's architectural features are offered multiple times throughout the day and last 45 minutes. Garden Toursare 45 minute tours of the grounds and Central Garden offered multiple times per day. The Family Room located in the museum courtyard adjacent to the East Pavilion has hands-on activities for kids. The Getty Center offers extensive programming from lectures and film series to concerts and family festivals. Check their calendar of events for the current schedule. The Restaurant at the Getty Center has one of the most romantic views of Los Angeles, which can make it a hard reservation to get on Valentine's Day, so plan ahead if that's your intention. Reservations are a good idea any time. The casual, self-service Café at the Getty Center is in the same building, on the lower level. For outdoor casual dining, the Garden Plaza Café offers lunch and snacks on a terrace overlooking the Central Garden. There are also coffee carts on the plaza and in the Museum Courtyard.